Physical processes, both those in Nature and those man-made, are governed by the laws of physics. These laws can be formulated in terms of mathematical equations, which can be solved numerically on computers. The software representation of a physical system constitutes a computational model that can be used to increase one's understanding of the system at hand, predict the behaviour of the system over time and under certain conditions, perform "what-if" analyses based on variations of input parameters, investigate the sensitivity of the system relative to parameters and other conditions, possibly steer the underlying process, etc. Such simulations are important tools in many disciplines, not only in the traditional engineering fields, but also in areas spanning from pharmaceutics to fluid flow in an oil reservoir. In most cases, models used for process simulation consist of ordinary and partial differential equations, combined with constitutive laws relating different physical entities to each other in an algebraic way. The model is typically defined over a physical domain that might have a complicated geometrical structure, and include coefficients and parameters that can have large variations. The geometry is then divided into adjacent smaller patches, forming a network of points (nodes) in which we try to compute the solution of the governing equations by terms of numerical approximations. All these factors contribute to the total complexity of the model, and influences how fast and accurate a solution can be computed. Mature understanding of the underlying physics combined with smart solution strategies and fast computers can provide reliable and very useful results for astoundingly complex models, such as simulating the effect of a chemical drug on a human organ or designing the next generation of offshore wind farms. 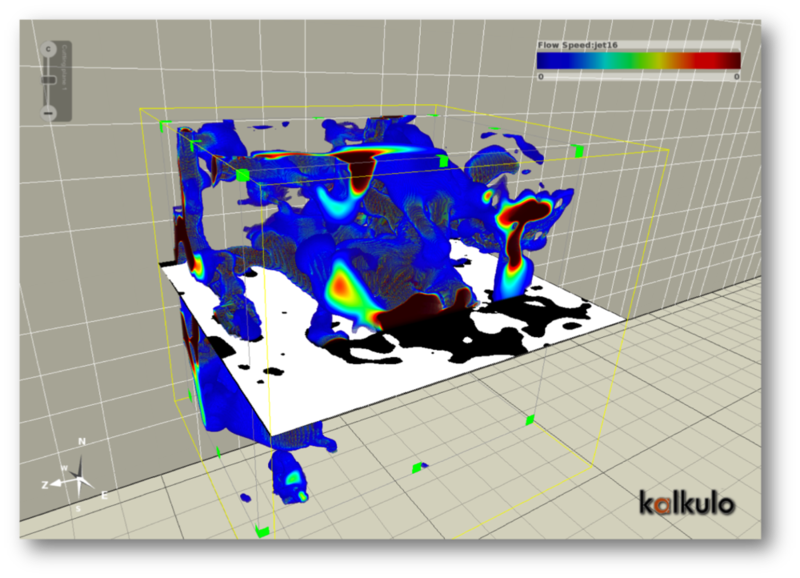 Kalkulo's experts have long experience with numerical simulations, across several application areas and based on many different numerical solution methods. When dealing with 3D geometrical objects digitally, one needs precise and efficient methods for creating the computer representation of the object from available data, as well as for manipulating the object over time and under different conditions. While geometrical models are needed to represent the computational domains for process models, they are also very valuable tools on their own. For instance, a cloud of measured points in 3D space gives limited understanding of the underlying physical object, especially when compared to the digitally tangible object appearing on your computer screen when the points are turned into surfaces, volumes, and topology that enrich the visual information. There are many ways to create a geometrical model, each with its pros and cons, indicating that experience and knowledge are needed to make the best decisions when solving a given problem. For instance, the methods used to represent and manipulate the soft shapes of a new car or plane body will fail when trying to model the complicated and very irregular geometry of a terrain with valleys, tall peaks and rapidly varying slopes. Kalkulo has strong expertise in geometrical modeling, in particular applied to complex structures in geology and in medical imaging. If I only had a proper model, I could tell...! Please feel free to contact us to discuss how computational models can add value to your business.